FASHION UNIQUE DESIGN - There are several colors available for this round style sunglasses: black, brown, pink, blue, silver, purple. It can go with various of features and clothings, which will be a good choice for fashion daily accessory. It is also the perfect choice for outdoor activities, such as driving, shopping, traveling and so on. 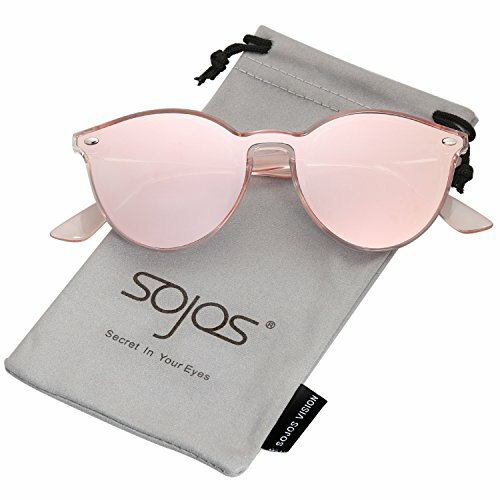 HIGH QUALITY MATERIALS - This SojoS Vision round sunglasses is made from high quality plastic frame, UV400 lenses, reinforced metal hinges, all the details ensure you a long time using. PRODUCT DIMENSION - Lens Width: 55mm(2.17inches) | Lens height: 48mm(1.89inches) | Temple Length: 150mm(5.91inches) | Nose Bridge: 12mm(0.47inches).